Karnataka Anganwadi Recruitment 2018 or WCD Notification is released by the Women And Child Development Department to recruit Various Anganwadi jobs in the Chikkamagaluru, Haveri, Yadgir, Uttar Kannada, Ballari, Udupi, Kolar, Tumkur and Shivamogga Regions in Karnataka state. So, Aspirants can check the Region wise details and need to apply for this notification by logging into @ anganwadirecruit.kar.nic.in before the last dates which vary for all the regions. Candidates from now can apply in online. You check out the official website. WCDW Karnataka Anganwadi Notification 2018: Good News for the Candidates who are in search of Govt Jobs in Karnataka. The Officials of WCDW released a Various Anganwadi vacancies notification for the recruitment of Anganwadi Helper and Worker Posts in Various Regions. And the Vacancies wise and area wise post allocation is specified clearly in the data provided. Aspirants need to apply for this in Online Mode from the link provided separately for each region. And the starting and ending dates for Anganwadi Recruitment 2018 Karnataka each region is separate. The Candidate belongs to the region specified need to apply for that separately. And the Post wise qualifications i.e for Anganwadi Helper and Worker Posts also differ and specified at the bottom. For more jobs just visit jobschat regularly. 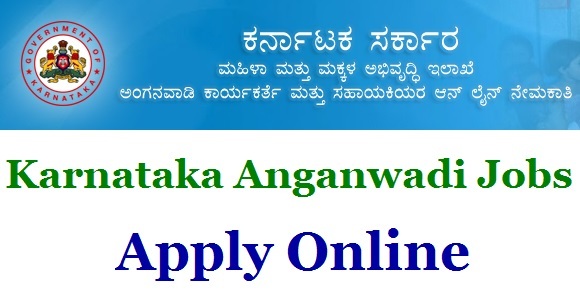 As Per the WCDW Karnataka Anganwadi Recruitment 2018 Notification, the eligible aspirants need to submit their application in Online Mode. Aspirants need to submit all the required credentials asked by the officials while applying. The officials will select the aspirants based on the recruitment rounds specified below. We insist the aspirants check the Previous Papers which will guide the aspirants to score high in the written rounds. Those who apply for another region won’t be eligible to take part in recruitment. So, we insist the aspirants check the details clearly while applying. And the aspirants also be ready with the Documents where the officials will check them during selection rounds. So, grab the information specified on Karnataka Anganwadi Recruitment Kar NIC. 1 Hassan (NEW) 5th Nov 2018 27th Nov 2018. 2 Belagavi (NEW) 5th Nov 2018 27th Nov 2018. 3 Ramanagar 01st Oct. 2018 31st Oct. 2018..
4 Mysuru 01st Oct. 2018 31st Oct. 2018. 5 Kodagu 01st Oct. 2018 31st Oct. 2018. Search for the Region wise Karnataka State WCD Notification 2018. Choose your near location notice and click on it. A new window will appear on the screen and Fill up your details. After completing the forms, just click on “Submit” Button. Take a print out or hardcopy. Vacancies In Number 45+ 234 Posts. Candidates, who want to apply for these posts, those ones must and should complete their S.S.L.C. Or Equivalent for Anganwadi Worker, minimum 4th Class & Maximum 9th Class for Anganwadi Helper. As per the rules Of Women & Child Development Department, Uttara Kannada. Anganwadi Worker 45 Posts Check Advt. Vacancies In Number Various Posts. Vacancies In Number 169 Posts. Start Date 01st Oct. 2018. End Date 31st Oct. 2018. Anganwadi Worker 05 Posts Check Advt. Last Date 31st Oct. 2018. End Date 02nd November 2018. Anganwadi Worker 22 Posts Check Advt. Vacancies In Number 113 Posts. Anganwadi Worker 03 Posts Check Advt. Applied candidates must and should complete their S.S.L.C. Or Equivalent for Anganwadi Worker, minimum 4th Class & Maximum 9th Class for Anganwadi Helper. Applied postulates must and should complete their S.S.L.C. Equivalent for Anganwadi Worker, minimum 4th Class & Maximum 9th Class for Anganwadi Helper. According to the Karnataka Anganwadi Uttar Kannada Recruitment 2018, the vacancies allocated to the Uttar Kannada Region is Various for the posts of Anganwadi Helper, Anganwadi Worker & Mini Anganwadi Worker Posts. And the eligible aspirants need to apply in online mode for this from the period of 13th August to 14th September 2018. Check the details enlisted below. Anganwadi Worker: SSLC or Equivalent from a reputed Organisation. Anganwadi Helper: minimum 4th Class To Maximum Of 9th Class. The Application Fee is not specified here. We insist the aspirants check the Karnataka Anganwadi Uttar Kannada Recruitment before applying. The Selected Aspirants will get the Salary as per norms of Karnataka Anganwadi and will be soon placed on the main site. According to the Karnataka Anganwadi Yadgir Recruitment 2018, there are various vacancies allocated to the Yadgir Region for the posts of Anganwadi Helper, Anganwadi Worker Posts. And the eligible aspirants need to apply in online mode for this from the period of 04th August to 03rd September 2018. Check the details enlisted below. The Application Fee is not specified here. We insist the aspirants check the Karnataka Anganwadi Yadgir Recruitment before applying. According to the Karnataka Anganwadi Ballari Recruitment 2018, the vacancies allocated to the Ballari Region is Multiple Anganwadi Helper, Anganwadi Worker Posts. And the eligible aspirants need to apply in online mode for this from the period of 01st to 30th August 2018. Check the details enlisted below. The Application Fee is not specified here. We insist the aspirants check the Karnataka Anganwadi Ballari Recruitment before applying. According to the Karnataka Anganwadi Udupi Recruitment 2018, the vacancies allocated to the Udupi Region is Various Anganwadi Helper, Anganwadi Worker Posts. And the eligible aspirants need to apply in online mode for this from the period of 01st to 23rd August 2018. Check the details enlisted below. The Application Fee is not specified here. We insist the aspirants check the Karnataka Anganwadi Udupi Recruitment before applying. According to the Karnataka Anganwadi Chikkamangaluru Recruitment 2018, the vacancies allocated to the Chikkamangaluru Region is various for the posts of Anganwadi Helper, Anganwadi Worker & Mini Anganwadi Worker Posts. And the eligible aspirants need to apply in online mode for this from the period of 30th July to 31st August 2018. Check the details enlisted below. The Application Fee is not specified here. We insist the aspirants check the Karnataka Anganwadi Chikkamangaluru Recruitment before applying. According to the Karnataka Anganwadi Haveri Recruitment 2018, the vacancies allocated to the Haveri Region is 95 for the posts of Anganwadi Helper, Anganwadi Worker & Mini Anganwadi Worker Posts. And the eligible aspirants need to apply in online mode for this from the period of 27th July to 27th August 2018. Check the details enlisted below. Anganwadi Worker & Mini Anganwadi Worker: SSLC or Equivalent from a reputed Organisation. The Application Fee is not specified here. We insist the aspirants check the Karnataka Anganwadi Haveri Recruitment before applying. The Karnataka Anganwadi Shivamogga Recruitment 2018 released recently. According to the notification, the vacancies allocated to the Shivamogga Region is Various for the posts of Anganwadi Helper and Worker Posts. The eligible aspirants need to apply in online mode for this between the period 01st to 25th August 2018. For more details check the complete information. The Application Fee is not specified here. We insist the aspirants check the Karnataka Anganwadi Shivamogga Recruitment before applying.